brisket – Damn, I Can Make That! Guys, it’s officially brisket day! 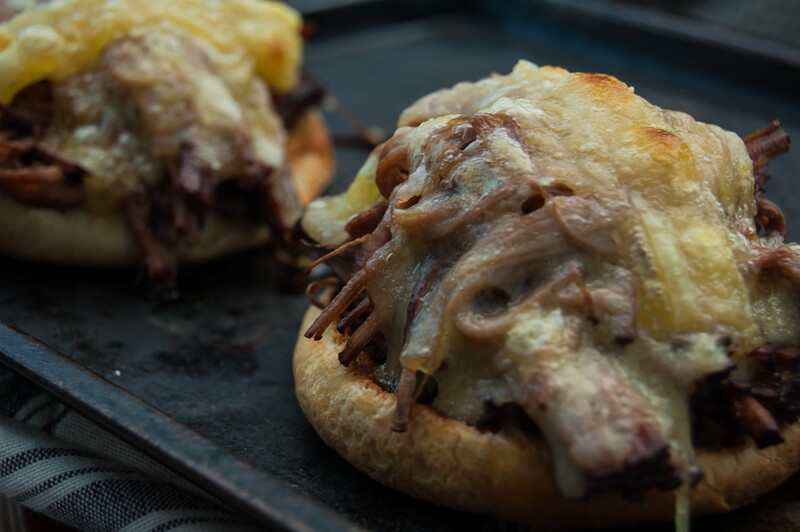 In honor of this yummy day, we’re giving you a damn delish brisket sandwich that’s drool-worthy. No need to give up your crock pot just yet. These melt-y, gooey sandwiches are really worth it. Trust me. And they’re perfect for company (or, you know, when you throw a party for brisket day). We’ve started a Tuesday night tradition with some friends to watch Game of Thrones (obsessed), and with these cooking all day while I’m at work they’re super easy to throw together before show time. If you’re starting this in the morning before work in the morning, give yourself a little extra time as you need to pre-cook the meat. I had three false-start mornings because I was trying to do this while running out the door. Over medium heat, add the oil to a skillet. Really lay on thick some salt and pepper to the beef, then place in the pan. Brown on both sides (but don’t cook it, the crock pot will do that). Place all of the ingredients in to the crock pot, with the brisket on top and cover with all of the liquids (broth, wine, and water). Cook on low for 8 hours, or on high for 6. When you’re ready to make the sandwiches, set your broiler to low. Using two forks, begin to pull apart the beef right in the crock pot. Scoop out the beef on to the buns. (If you’re feeling adventurous, you can put some carrots and potatoes on the sandwiches too.) Lay the swiss cheese on top and place in the broiler until melted. In small bowls on the side of each plate, spoon out the beef broth from the crock pot to use as the “au jus”.